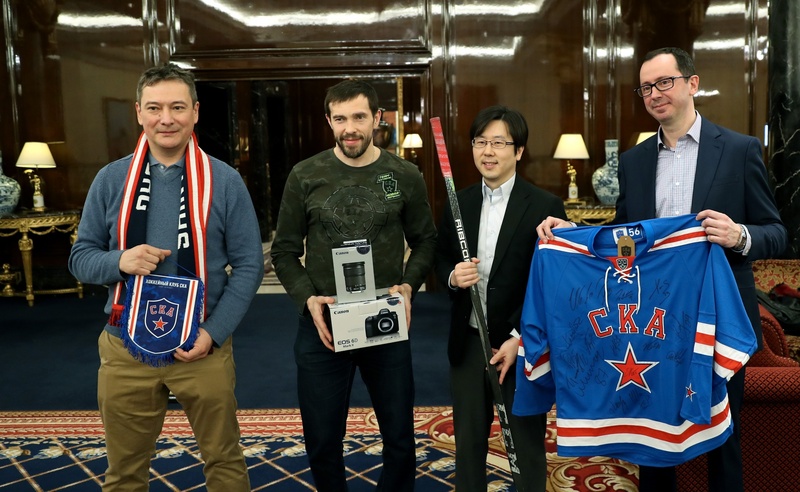 The Kontinental Hockey League has joined forces with Canon and devised a new and exciting competition to reward the finest photographs taken at matches in the KHL Championship over the 10-year history of the League. Photographers can submit their best shots in two categories – "Sport" and "Fans," while another prize, – "Audience" – will be awarded to the winner of an open vote on the website. Denis Kazansky – well-known commentator on the federal Match TV channel. To apply, candidates need to register on the canon.khl.ru site at any time up to and including April 30, upload their entries, specifying name, description, and technical information. Each participant can submit up to 10 photos, and one photo can not be entered for a prize in more than one nomination. The winner of the photo contest in the Sport category will become the proud owner of a Canon EOS 5D Mark IV camera and will be invited to attend the Closing Ceremony of the KHL season 2017/2018. Winners in the categories "Fans" and "Audience" will be presented with Canon lenses. “Life flies past so fast these days, and a photo is a great memento. You look at the picture and recall all that you experienced and what your feelings were at that moment. When I look at photos of me on the ice, I often try to remember what I was thinking at that very moment. These are really action pictures. And more than just a reminder of the matches. There is a lot of emotion in action photos from matches, you always look at them and remember these moments with warmth. There are, of course, photos which remind us of our shortcomings, but without these, you could never take a step forward! "In the photographic craft I have two idols - Vladimir Bezzubov and Yury Kuzmin. They both photograph hockey, and in my view they do this better than anyone else in the country. If you see the incredible emotions on the faces of the players or "arms entwined, legs entwined, fates entwined" in a battle for the puck. We have ambition in abundance, especially out in the regions. Do you snap away for your own pleasure from sporting tournaments, or solely on the instructions of the editorial board? Do you feel undervalued? This is your big chance to get the recognition you deserve and the new equipment you need. "To all fans, and to be precise, connoisseurs of sport, the associative chain CANON-Sports-Photography has always been a vital and well-established part of any sporting event. But until recently, in this field, hockey has been somewhat in the shadow of other sports, such as football, athletics, Formula 1. And I am sincerely delighted that we at Canon Russia were among the first to understand the need to correct this, and that our colleagues from the KHL supported us. As a result of this joint effort, we saw the birth of exciting projects as, for example, our workshops for sports photographers in different cities of Russia on KHL match-days, in addition to this wonderful photography contest, which we are very happy to present before you today. Incidentally, today I am proud to announce that our European headquarters rated this local initiative for rapprochement with hockey very highly, and as a result, for the first time in a long time, CANON will sponsor the forthcoming World Championships in Denmark! I am sure that thanks to our competition, run in close cooperation with the KHL, the lucky winners will receive not only professional photo prizes from Canon, but also a vast audience of KHL viewers interested in and able to appreciate the wonderful work performed by these artists with a camera. “I think that in recent times it has become very difficult to photograph a hockey game and get that top-class image which literally grabs the soul. A couple of years ago, I put together an album of hockey photos, incuding some from the first World Championships, when they were all still in black and white, and also from modern-day matches. And these pictures tell a great story, all moments in time! The atmosphere, the uniforms, the spectators, all in the frame. Now, in my opinion, there are fewer photographs of the kind I seek out, and I'm looking to see some captivating images among the competition entries.